Welcome to the sixth annual review of DivGro, my portfolio of dividend growth stocks. I created DivGro in January 2013 to generate a reliable and growing dividend income stream. In annual reviews, I look at DivGro's performance as measured by dividend income, dividend increases, annualized returns, and rate of return. I also look at some highlights of the past year and share my outlook for the coming year. Keeping track of DivGro in a public forum has helped me to learn and grow as a dividend growth investor. Much of my learning has come from interacting with like-minded investors, so Thank You! to all my readers for your encouragement, questions, and comments. Please keep them coming! 2018 kicked off with a spectacular January performance, but February handed us the first corrections of the year when the S&P 500 dropped about 10.6%. It took the index until August 24 to recover, and by the end of September, the S&P 500 had reached an all-time high of $2,940.91. Then October happened... and December! Over the 3-month period spanned by Q4-2018, the S&P 500 dropped 19.8%, technically avoiding the 20% threshold that would have introduced a bear market. But several sectors moved into bear market territory in December, and more than half of the S&P 500 stocks dropped at least 20% below their 52-week highs. In January, the markets have recovered some of December's losses, but we have a long way to go! The outlook for 2019 seems cautious and market uncertainty remains high. The ongoing trade war with China, the federal government shutdown (now temporarily resolved), continued rate increases by the Federal Reserve, and worries about an approaching recession, all are factors that increase uncertainty and volatility. In 2018, I reduced DivGro's risk profile by trimming or closing riskier positions and adding high-quality stocks with strong dividend safety ratings. With projected annual dividend income of more than $23,000, my portfolio has evolved into a proverbial dividend-generating machine. Let's take a look at DivGro's performance in 2018. The main goal of DivGro is to generate a reliable and growing dividend income stream. 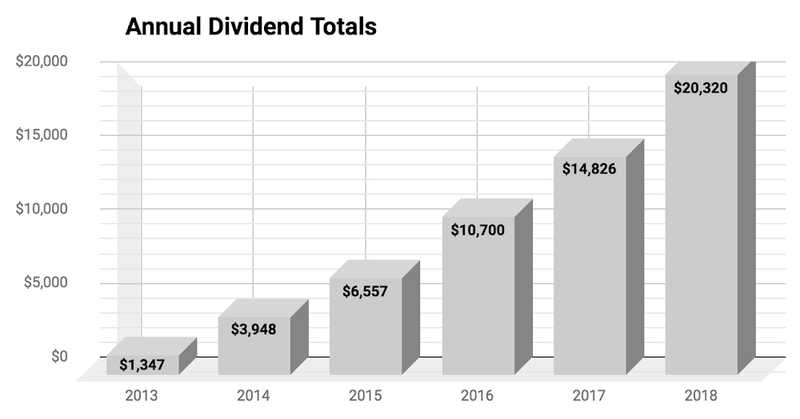 In 2018, DivGro generated dividends totaling $20,320, an increase of 23% over the 2017 total of $16,533. In 2017, I collected $14,826 in dividends and recognized an additional $1,707 of past dividend income. Projected annual dividend income (PADI) increased by 46% to $23,157, meaning I can expect to earn monthly dividend income averaging at least $1,930 in perpetuity. (PADI one year ago was $15,885). Of course, DivGro's PADI should increase over time because I invest in dividend growth stocks. Furthermore, I plan to reinvest dividends until retirement, so DivGro's PADI should continue to grow through dividend growth and through compounding. The table includes the new yield on cost (YoC) for positions still in my portfolio. The arithmetic average of the 59 increases is 10.68%, up from last year's 7.74% from 43 increases. I like to see dividend increases of 7% or higher. In the following chart, DivGro stocks with year over year increases of at least 7% are shown in shades of green. I'm happy to see that more than half of the stocks in my portfolio have year over increases of at least 7%! In 2018, the S&P 500 lost 6.2%, the Dow lost 5.6%, and the Nasdaq lost 3.9%. That makes 2018 the worst annual performance for the three indexes since 2008. Given this context, it is unsurprising that DivGro's year over year performance is a mixed bag with more losers than winners. Of the 42 dividend-paying stocks I owned throughout the year, 16 traded up and 26 traded down. Overall, these positions are down 6.7% on average. I also own a few stocks that do not pay dividends, as well as two funds that do. Adding these positions improves DivGro's year over year performance to an average loss of 5.6%. Essentially, the performances of Netflix (NFLX) and Amazon.com (AMZN) made up the difference. By the way, these returns do not include dividends. While stocks like Ford Motor (F) and CVS Health (CVS) have negative returns, overall these stocks have returned 13.7% on an annualized basis. Microsoft (MSFT) (+43%), UnitedHealth (UNH) (+36%), and Aflac (AFL) (+32%) are the top performing DivGro stocks. All three are Home Run stocks, a designation I give to stocks in my portfolio that achieve total returns of 100%. DivGro's IRR (internal rate of return) provides the best measure of overall portfolio performance, as IRR takes into account the timing and size of deposits since inception. On 31 December 2018, DivGro's IRR was 13.5%, down from the 17.4% reported for 2017. At the end of 2018, DivGro's average YoC was 3.8%, down slightly from 2017's average YoC of 4.0%. Over time, as stocks I own pay higher dividends, DivGro's average YoC should increase. My long-term goal is to achieve and maintain an average YoC of 12%. DivGro's payback increased from 11.3% at the end of 2017 to 13.1% at the end of 2018. Payback is the proportion of capital returned as dividends. I consider it to be a reasonable measure of portfolio maturity. AllianzGI Equity & Convertible Income Fund (NIE) tops the chart, mainly because of the fund's high yield (currently 7.63%). The runner-up, Main Street Capital (MAIN), also has a high yield (currently 6.4%), and it is one of my longest-term holdings. The 2018 stock market will be remembered more for its volatility than for its performance. But the S&P 500 reached an all-time high on 20 September and the Dow set a new record on 3 October, so it wasn't all that bad. In 2018, DivGro's market value briefly topped $700,000 before promptly dropping again! Dividend income topped $20,000 and options income topped $22,000. This is the first year that options income exceeded dividend income! The extra income generated by trading options allows me to buy more dividend growth stocks, so boosting DivGro's dividend-generating capability. 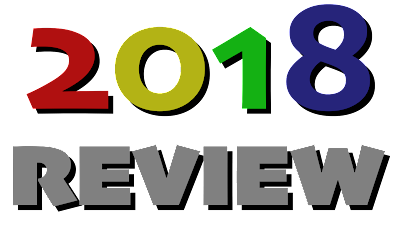 In my annual reviews, I also like to share some personal highlights. Last year, Pixar's Incredibles 2 smashed box office records with the biggest opening ever for an animated feature film. And I'm happy to say that both Incredibles 2 and the short film that played before it, Bao, were nominated for an Academy Awards! Other highlights are that our two youngest sons got engaged in 2018, so we'll be celebrating two weddings in 2019! We're hoping to have both sets of grandparents at both weddings, just like for my oldest son's wedding in 2017! 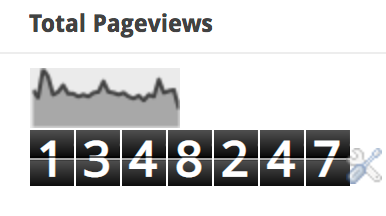 DivGro's page views (pv's) reached the one million mark on 16 December 2017. Since then, I've added nearly 350,000 additional pv's. Over the time range covered by the table above, I averaged about 888 pv's per day, or about 27,022 pv's per month in 2018. In comparison, 2017's average was about 30,842 pv's per month. I've set some challenging goals for 2019, including a very aggressive goal of collecting $21,000 in options income. Adding $25,200 in dividend income and $5,200 from publishing gives a total of $51,400 to put to work in DivGro in 2019. A special word of thanks to all my readers, especially to those that comment regularly and continue to encourage me! This community is amazing and I really love being part of it! Thanks for reading and all the best with your investing in 2019! Congrats on the successful 2018 and also on the family engagements - it appears you have much to look forward to in 2019 on all fronts! Thank you, Passive Income Vortex -- I appreciate your comment and kind words. All the best to you in 2019 and happy investing! That's fantastic. What a year you have had. This year if you continue to put more towards your income you should be over $25k a year. That is amazing work and proof that your money is working for you. Well done. Hi, Buy, Hold Long -- good to hear from you again! Thanks for commenting and for your kind words of support. I sure hope I can hit the $25k this year! Take care and all the best with your investments! Thanks, Flora -- I appreciate your comment and all the best with your investments! I always read your article well. Thank you. I look forward to seeing you again. Thanks for commenting and all the best with your investments! Great job this year! Keep up the good work! Thanks, Eric -- I appreciate your comment! All the best with your investments!